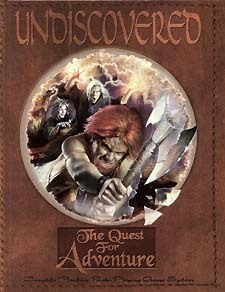 This complete version of Undiscovered: The Quest for Adventure supplies you with all the information included in the Player's Codex, as well as all the information you need to run an Undiscovered game. We have supplied you with a campaign world, the history of the world and its gods, a detailed empire complete with legendary heroes, a detailed city with important people and place of note, and a horde of monsters to let loose on any unwary adventurers. Imagine a place of wonder, where an adventurer can be skilled in both steel and magic. A world where empires and kingdoms have grown from a world lost to choas. A land where races co-exist in cities and towns. A world where hereos rise from the settling dust to take on all challenges and to etch a place in the world to call their own; a place in history. Character design allows you to customize your character any way you choose! * This classless, point-based system allows you to let loose your imagination and create a character you want to play. * Select from over 150 skills, with 5 levels available in each skill, in skill groups including Offensive Combat Skills, Divine Skills, Psionic Skills, Sage Skills, Streetwise Skills, and Wilderness Skills. * Limitless character advancement allows for limitless creativity in developing your character. * No restrictions on matching races with skills. * Choose from among 18 different races including Civilized Humans, Ice Elves, Dragon Dwarves, Seraphs, Cave Dweller Muklags, and Menim Draconmenses. * Use monstrous races, such as Centaurs, Mermaids, Goblins, Ogres, and Trolls to create an adventuring character. * Complete felxibility is provided through attributes, allowing two similarly skilled characters to be totally different! For example, a fighter with great strength can cause severe damage in a fight. But a fighter with great endurance can withstand more punishment. Smart fighters are able to learn more skills, and thus advance faster. Spirited fighters have a better chance of learning new skills and advancing their current skills. Dexterous fighters gain bonuses to strike in a fight. Agile fighers are able to dodge hits easier. And even lucky fighters have the chance to gain bonuses to damage, striking an opponent, dodging a hit, or even to increase their Life Point score! * Select or roll your scores for 8 seperate attributes, such as Strength, Spirit, Agility, and Charm. * Use skills to increase your attribute scores. * 180 spells within 6 Covens of Magic. * Over 100 powers within 4 Psionic disciplines. * Over 75 miracles within 11 Divine groupings, and a pantheon of 28 deities (plus ancestral spirits for shamanic peoples).